Justin is eleven years old and has been in the care system since he was five. When Casey’s link worker asks her to take Justin on, he explains some of the boy’s troubled past. Casey learns that he was taken into care after a series of neglect allegations. The final straw was when he set fire to the family home. He escorted his two younger brothers to safety, but made certain that his mother’s pet dog died in the flames. Since that day, Justin has disrupted twenty foster placements and it seems that Casey is his last hope, before going into a secure residential unit. Casey and her husband Mike, alongside their own grown up children Riley and Kieron, decide to offer their home to Justin, and look forward to this new and exciting challenge. As soon as their new addition moves in, the family realise that there is a lot more to Justin than they had been led to believe. He makes his mark by destroying things, swearing and expressing his hatred towards women. He has food obsessions, is aggressive and makes it clear that he doesn’t want to stay. Casey is finding it a struggle to understand what triggers these outbursts, and after discovering that Justin is also badly cutting himself with blades and knives, she begins to question her own abilities. With support from her family and her link worker, Casey manages to persevere and is rewarded by a breakthrough. Justin starts to show signs of settling down and begins to trust Casey enough to talk about his past. It becomes clear that this is just the start. 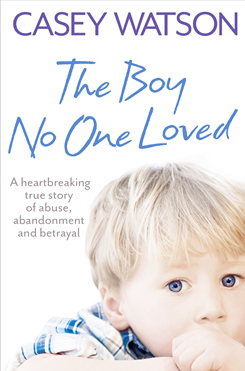 One night, Justin breaks down and discloses horrific sexual abuse that he had been subjected to as a five year old. This evokes more memories and his past begins to unravel. The family are taken on a roller coaster of emotions as they travel along with Justin on this traumatic journey of self discovery.